With either black slim fit pants or a suit, this teal color dress shirt will have you looking like a boss. Featuring that slim fit cut and style that just says money. 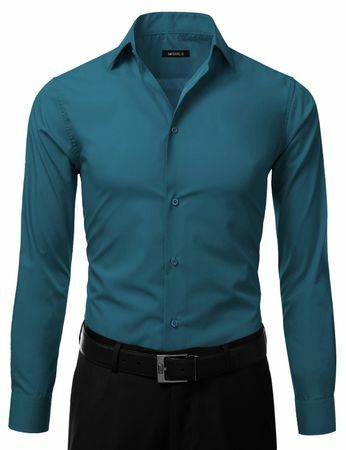 This teal color slim fit dress shirt will add that touch of color that will just spell success on club night. Featuring a classy button down style with regular collar and basic cuffs. There is no reason not to have some color dress shirts in your slim fit wardrobe. Made of cotton blend fabric.